The Spanish Ambassador to the Democratic Republic of the Congo has been fired after he was caught flogging off Spanish visas for €2,900 a piece. Antonio Fernández de Mazarambroz got wind that internal affairs were investigating his little sideline, and promptly filed a complaint alleging that some of his staff had been fiddling the accounts. However, on investigations, Madrid discovered that it was Antonio who had been slipping the Congolese the visas, in exchange for a gratification. The ex-Ambassador is the ratty looking one with the glasses. 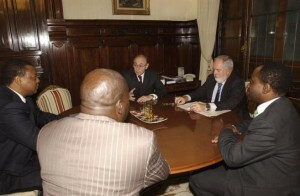 The fat bloke next to him is Minister of Agriculture, Arias Cañete. Several other members of staff are under investigation for helping him. Antonio had been in Kinshana since May 2012. Although he was fired in January, officially he’s “resigned with immediate effect”, notes El Mundo, who pointed out that he’s allowed to keep his pension and his honour. Also, the Ministry didn’t announce the scandal until El Mundo started sniffing about, although it seems it was an open joke in Kinshana, and several other EU embassies in the city had privately complained to Madrid about his activities. Thing is, this crook had a track record of this sort of thing which had been hushed up. In 1987, he was removed from his post as Consulate General of Nador without reason or explanation given – El Mundo says that “off the record” he’d “exceeded his duties”, most probably to do with arranging express transit through Spanish customs of shipments arriving at the port. He’d also been reprimanded for having an affair with the wife of a Spanish military official. This entry was posted in Blog and tagged ambassador, congo, corruption, kinshala, visa by David. Bookmark the permalink. Definitely not surprised. Widespread corruption is just one more reason Catalan citizens want out of a rotten undemocratic Spanish state.